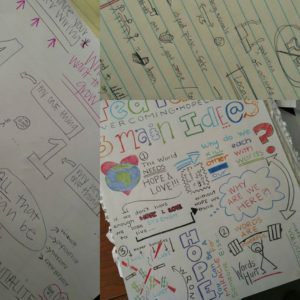 As many of you know, I’ve been working to develop a sketchnoting practice for a number of years. This practice of drawing or sketching has provided me with a good deal of structure both as a teacher and as a thinker, and I wanted to pause for a moment to demonstrate how/why this seems important. My colleague, Abigail Selzer King, and I worked with some students to present some of this work at SIGDOC. We provided a workbook, and we challenged participants to consider how drawing might help them solve problems. But, of course, as we shared in our workshop, drawing has been solving teaching and thinking problems for us for years. I began sketching fairly modestly, after a number of instructive sessions with Pat Sullivan [dream mentor], who would often say: “Can you draw me a picture?” This makes sense, of course, because in Opening Spaces, she [I’m pretty confident this is her and not Porter] writes that pictures help her think. Turns out, they help me think too. I am hesitant to claim that I teach through sketching explicitly, but I definitely sketch to plan. The sketching helps in a number of ways: 1) it helps me show students the interconnectedness of content that otherwise gets presented linearly; 2) it helps students imagine and reimagine the way readings and course content might be synthesized, and 3) truth be told: it keeps my planning down to a minimum. 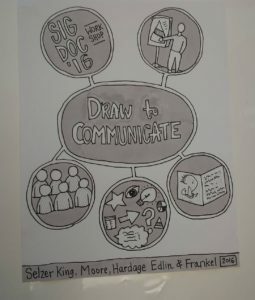 I shared this advice with the Draw to Communicate workshop, and one participant reported that it had worked for him too: keeping yourself down to one page can be a dream. 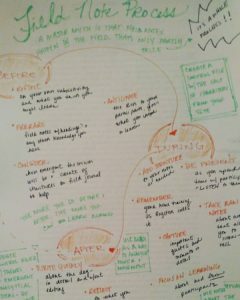 So, for example, my sketchnote for the Field Note process kept the class prep to one single page [yay!] and showed the rather linear process of how a field worker should be thinking about their research before, during, and after the process. This is much different, say than lesson on Weintraub’s theories of public and private, which you can view here: weintraub_krmsketchnote. My lesson on Weintraub relies on a modular page pattern, which organizes information much differently. When I introduce students to the idea of sketchnoting, I most often do it through two major lessons: 1) the introduction of page patterns (post coming soon) and 2) the introduction of seed shapes (also coming soon). I argue, following Mike Rohde, that with 5 seed shapes (a dot, line, triangle, square, and circle), they can sketch anything they see. By arranging words and images in containers [boxes, circles, etc] and by organizing the page using dividers, students can listen and take notes without having to worry about the minutiae. I argue to students that if they want to be able to understand the broad concepts, then they must necessarily let go of the tiny details and instead try to connect major themes and ideas. 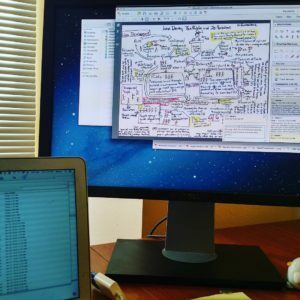 Like my undergrads, my grad students have taken up sketchnoting as both a listening tool and a thinking tool. They borrow different page patterns and see if they can “think differently” about an idea or set of ideas with different page patterns. This is the same challenge I gave to myself when I first started investing in visual thinking. Having just picked up a Grids and Lines Architect’s book [by Princeton], I challenged myself to handle the ideas I was thinking with whatever page pattern came next. Doing so moved me outside of my way of thinking and into a new format for interacting. 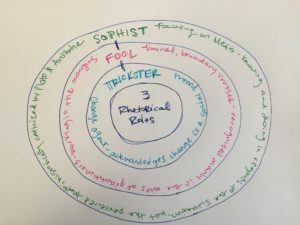 Graduate Student thinks through Savage’s Trickster, Sophist, Fool. Developing new strategies to comment on students’ work.